Interested in what we believe and practice? Whether you’re a life-long Lutheran who wants to revisit the Bible and Catechism, or someone just looking, you’re welcome in our Catechism Bible Study. Thursdays from 7:00-8:30pm at our Student Center (303 N Clay St.), beginning January 29, 2015. 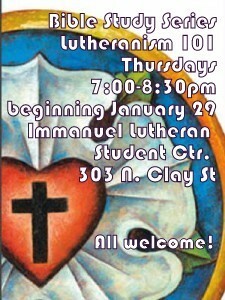 If you have questions about the class, just contact Pastor Burdick. He’ll be glad to talk! Introduction. Knowing about God. Knowing God. One way? The Bible. Luther’s Small Catechism. Doctrine. Law and Gospel. Commandments 1-3. American idols. Bad and good ways to use God’s name. Reasons to be thankful. Do we have to worship on Sunday? What’s a Sabbath? Honoring God’s Word. Second Table of the Law: Commandments 4-10. Love for God. Love for neighbor. Who has authority for me on earth? What about murder, hatred, abortion, and taking care of my body? God’s gift of sexuality and marriage. What about divorce? Have I stolen anything? How can I be a better steward? Gossip. Reputation. Standing up for my neighbors’ honor. Coveting and the gift of contentment. Actual sin. Original sin. Sins of omission and commission. The purposes of the Law. Revisiting Law and Gospel. Apostles’ Creed. God as our Father. Creation. Angels. The Fall into sin. Apostles’ Creed, second article. The nature and the work of Jesus, the Christ. Was Jesus damned? Did he bodily rise from the grave, or just spiritually? The return of Christ. Apostles’ Creed, third Article. The person and work of the Holy Spirit. What is “the Church”? What about different Christian denominations? The central doctrine of the faith: Justification by grace, through faith, for Christ’s sake. Will my body be resurrected? Eternal life now and forever. Prayer. Are all prayers heard by God? God answers every Christian prayer. How should I pray? Do I have to forgive someone who sins against me? What’s the greatest evil? Does “Amen” mean the end? The Sacrament of Baptism. What’s a sacrament? Should infants be baptized? What happens in baptism? Should you be re-baptized once you’ve come back to the faith? Can I be immersed? Must I be baptized? How do I live my baptism every day? Confession, Absolution, and the Office of the Keys. What is repentance? Whose sins are forgiven? Why can’t women be ordained into the pastoral office? Is a pastor a servant or a lord? Should we ever excommunicate a person from the church? I don’t want to know if your church is friendly, I want to know if it’s forgiving. The Sacrament of the Altar – Holy Communion. The real presence of Christ in the Lord’s Supper. How should I prepare? Why close communion? Am I worthy? What are the benefits of the Lord’s Supper? A brief history of Martin Luther. Plus, “wrap up.” Loose ends. What next? It’s important to know what you believe and why you believe it. Here’s an opportunity!